If you are a lover of chocolate then this book is for you! Filled with 25 heavenly chocolate creations, you'll be able to spoil everyone with wickedly good chocolate treats. Starting off with the basics, you'll find a handy list of all the tools you'll need to create these amazing choccy sensations, and how to do things such as tempering chocolate. You'll also learn the difference between true chocolate paste and chocolate-flavoured sugarpaste and how to use and store it. 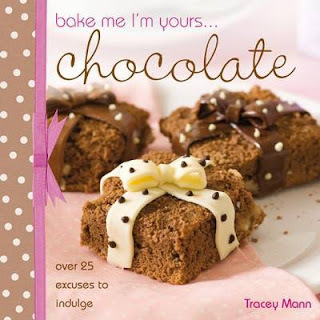 The book then moves on to Tracey's tried and true recipes for everything from chocolate sponge cake to brownies, bites and truffles. Tracey also shows you how to make decorations for your cakes and treats out of chocolate with step-by-step instructions and a handy section just for making chocolate flowers. Once you've got these basic things down you can then choose from 25 amazing designs, some of which I just don't know how she gets them looking so good, despite all the excellent instructions and pictures, they are works of art. Best of all, the book is small and compact, hardcover to make it last longer, and lies flat on the table. I've mentioned before that I'm not much of a cook, but I could just sit and look through this book all day, the images of her chocolate creations are so sumptious your mouth will be watering before you get to the end! If you're a bit of a chocolate fiend and you'd like to grab a copy of this book, you can find it for sale online here.